Leonardo Senkman (Parana, Argentina, 1941). PhD in History, Universidad de Buenos Aires, where he taught until he moved to Israel. 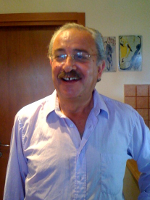 He lives in Jerusalem since 1985 and during thirty years taught Modern Latin America History and Culture at the Hebrew University of Jerusalem; he continues to research as fellow of the Harry Truman Research Institute. He is also the director of academic programs in Latin America and Spain of the International Center for University Teaching of Jewish Civilization, and member representative in Israel of the National Academy of History of Argentina. He is author of many publications on history of immigration, refugees and exiles to and from the southern cone of Latin America countries as well as of essays on Jewish writers in Argentina, Brazil and Mexico, and on intellectual history. He also does research on Contemporary Jewish thought. Some of his books as editor or co-editor: Judaica Latinoamericana III, Estudios histórico-sociales, co-edited with Silvia Schenkolewski-Kroll (1999); Ensayos sobre Cábala y Misticismo Judío, co-edited with Yom Tov Assis and Moshe Idel (2006); Identidades judías, Modernidad y Globalización, co-edited with Paul Mendes Flohr and Yom Tov Assis (2007); Encuentros culturales de paganos, judíos, musulmanes y cristianos en la historia, co-edited with Yom Tov Assis and Cyril Aslanov (2008); Fascismo y Nazismo en las letras argentinas, co-authored with Saúl Sosnowski (2009); Pertenencia y alteridad. Judíos en/de América Latina, co-edited with Haim Avni, Judit Liwerant et al. (2011); Máximo José Khan, Arte y Torá, co-edition with Mario Martín Gijón (2012); Alberto Gerchunoff, Entre Ríos, Mi País (2015); and Exile, Return, and Diaspora: Changing Cultural Landscapes in Argentina, Chile, Uruguay and Paraguay, co-authored with Luis Roniger, Mario Sznajder, and Saúl Sosnowski. (2018). Figures and images of Colonia Condesa in Todo aquí es polvo (2010), posthumous book of memories by Esther Seligson, as well as in other fiction texts where she recovers moments of her urban family life during childhood and adolescence, but without the intention of writing ethnic neighborhood literature, nor to compose a city-text of Mexico City. In the second part, the Seligsonian strategy of revealing a deep and open Mexico in a syncretic semantic field where narrative and lexical voices of the Nahuatl legacy, Talmudic Judaism and Kabbalist, as well as the sacred culture of Tibet and Hinduism, are analyzed. Figuraciones e imágenes de la Colonia Condesa en Todo aquí es polvo (2010), libro póstumo de memorias de Esther Seligson, además en otros textos de ficciones donde recupera momentos de su convivencia familiar urbana durante la infancia y adolescencia, pero sin intención de escribir literatura barrial étnica, ni tampoco componer una ciudad-texto de la Ciudad de México. En la segunda parte se analiza la estrategia seligsoniana de revelar un México profundo y abierto en un campo semántico sincrético donde fulguran voces narrativas y lexicales del legado náhuatl, el judaísmo talmúdico y el cabalista, además de la cultura sagrada del Tibet y el hinduísmo.